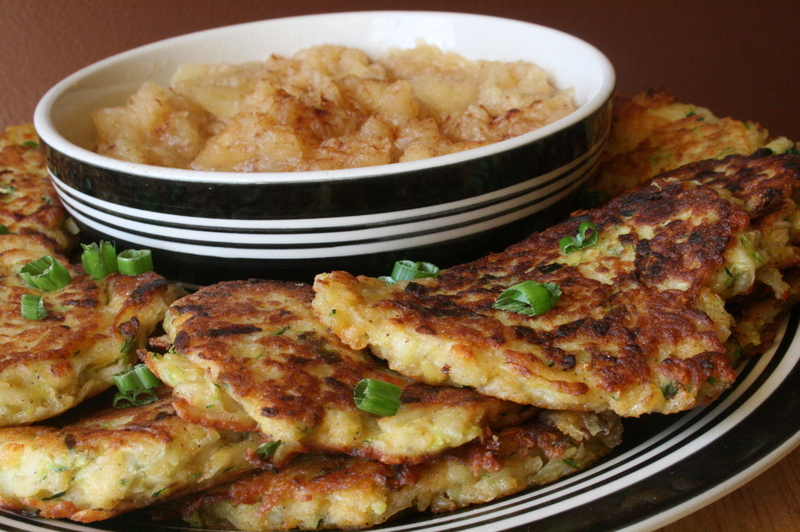 Zucchini Parmesan Latkes - Kosher In The Kitch! 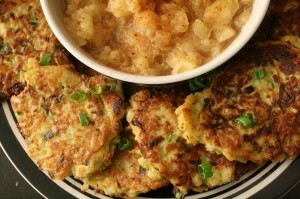 Zucchini Parmesan Latkes - Kosher In The Kitch! Hanukkah, the holiday of all things fried and delicious is upon us! Much like children who wait for the holidays to unwrap presents, I eagerly anticipate the festival of lights so I can bite into powdered jelly donuts and fried potato latkes. While I usually try to eat a balanced healthy diet, I always give myself the green light on Hanukkah to indulge in all things sweet and savory. When you eat good year round, it doesn’t feel very bad to nosh when the holidays come around! That said, this year I decided to try and make the usually greasy pancake a bit lighter. This is the healthiest recipe I could come up with that still screams eat me cuz I have been fried for Hanukkah! I like the extra crunch the panko crumbs add, however if you really want to cut out any extra “pounds” you can leave them out as well as the potatoes and only use 2 eggs. Personally, I would rather have a smaller portion of something that tastes great then a full serving of something low fat. 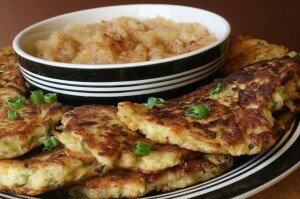 The apple cider/apple sauce sounds amazing, and something new to try.